Guerlain has launched Mon Guerlain Bloom of Rose, a new fragrance for women. 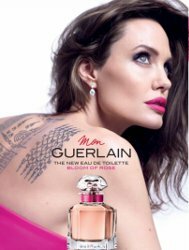 Mon Guerlain Bloom of Rose is a flanker to 2017's Mon Guerlain, and follows last year's Mon Guerlain Florale. Floral. Radiant. Lively. Delicate. 'Mon Guerlain' is a tribute to today's femininity. A strong, free and sensual femininity, inspired by Angelina Jolie. With the Eau De Toilette Bloom of Rose, 'Mon Guerlain' continues to explore the different facets of femininity, fulfilment and invites women to live each moment to the fullest. A composition that celebrates the joy of individuality and being yourself. This floral Eau De Toilette is created like a bouquet - the signature floral notes of 'Mon Guerlain' - Sambac Jasmine and Carla lavender - are combined with neroli and rose to form a radiant and lively fragrance. Additional notes for the floral fragrance include mandarin, blackcurrant, green apple, vanilla, sandalwood and white musks. Guerlain Mon Guerlain Bloom of Rose is available in 30, 50 and 100 ml Eau de Toilette. It can be found now at Debenhams in the UK. Yeah, they tend to announce so many in January…I don’t know why Guerlain does not spread out the flankers better.